Formatting an SD card is very easy on a Chromebook. 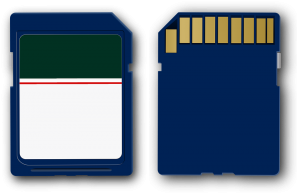 Most users will want to format an SD card after purchasing one. First, plug in the SD card (check out this page for reviews of some of the best Chromebook SD cards). Most Chromebooks unfortunately have an SD card slot that’s about half-depth, so you end up with half your SD card sticking out. The low-profile USBs are a better bet for storage that you can leave in there. Most Chromebooks also include USB ports and an SD or microSD card slot that you can use to expand storage. After inserting the SD card (or MicroSD card) into the Chromebook, open up the Files app (the blue folder icon). In the navigation sidebar find your device (if you have more than one connected make sure that it’s the correct one before proceeding). Right-click on the drive you wish to format and select the ‘Format Device‘ option from the menu. The SD card should be formatted very quickly. Larger SD Cards on a Chromebook may take a little longer to format. Chromeooks will format SD Cards to the default FAT32 filesystem. When formatting has completed you will see a small toast appear in the lower right hand corner. It can also read the Mac HFS+ file system, but it can’t write to it. Chromebooks support the MTP protocol for digital cameras and music players, and for external disc drives that connect via USB, Chromebooks can read the ISO9660 and UDF file systems on discs. See more information about supported file systems on a Chromebook. To remove your external storage devices, you must click the Eject button, which is located next to the device name on the left side of the Files window. Once you’ve clicked the Eject button, the device will vanish from your Files window, indicating that it is safe to remove from your Chromebook. To safely remove your external storage devices, you must click the Eject button, which is located next to the device name on the left side of the Files window. You should see a little triangle/arrow next to the SD card in the Files app. Just click on it, the card name will disappear, and you’re good to go. You can transfer your files manually to your Flash Drive or Memory card using your Chromebook.